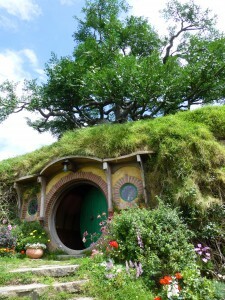 For those of you who have been lucky enough to visit the Hobbiton set (like me! ), you know how magical it is to wander among the well-tended gardens and Hobbit-home facades, to rest in the shade of the magnificent party tree, and to enjoy a pint at the Green Dragon Inn. 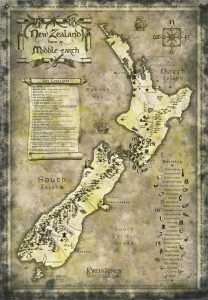 However, as most of us are aware, the Hobbiton set is surrounded by a 560 hectare (approximately 1,400 acre) working sheep and cattle farm owned and operated by the Alexander family. MIRAMAR, New Zealand — The director’s tent. Inside a sound stage, or outside on location, it is a constant and central fixture on a movie shoot. 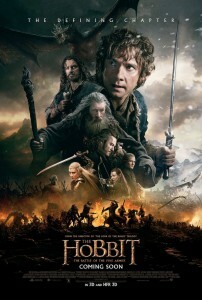 It is home base for Peter Jackson and his team. It is sacred ground — more or less. The decisions made inside it, by the team, under Jackson’s direction, are crucial to the project where it is determined what will later happen in front of the camera. So every day, whatever happens to a set or a sound stage overnight, the tent is there set up and waiting for the core of the shooting unit. Editor Jabez Olssen, Script Supervisor Victoria Sullivan and First Assistant Director Carolynne Cunningham call it home during the shoot. Cunningham is outside of the director’s tent a lot, Olssen and Sullivan less so and Producer Zane Weiner is always near. Jackson’s assistant Sebastian Meek is in and out at all times, bringing badly needed tea and watching the door from outside to eliminate distractions inside. Jackson lives on tea and Meek has a talent for having it handy at the perfect moment. 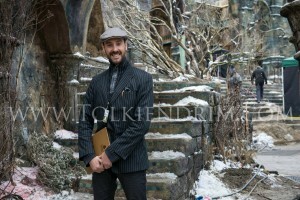 In April, 2012, as a representative of fandom via TheOneRing.net, I was invited to be on set during five weeks of the filming of the Hobbit films. At the time, it was still scheduled to be two movies and the production had just settled in to shoot in studio instead of on location. Much was unknown then, that now is completely familiar to fans. When I first arrived at Stone Street Studios, the publicity team took me to set, showed me the ropes and left me to my own devices during the rest of my stay to meet folks and get interviews, which was great — no time and no need for babysitting. I was there to be a good guest and to observe. Two weeks later I was definitely convinced I had no chance of talking to Peter Jackson, except for an occasional, “Hello, how are you getting on?” from him during my time there. Fans world-wide know from production diaries, how exhausted Jackson gets during the shooting phase of filmmaking. It is important to really understand why. Peter Jackson is a busy guy. Particularly when he is shooting, there is a lot to do in a day and a lot of people that need to understand his vision in order to do their jobs well; he is the hub of the great spinning wheel. He is the director, a writer and a producer — each a big job on its own. Many films have one of each of those, or several of some, all working together. But Jackson was all of them at once and combining titles didn’t mean there was less work to be done. Just because he was reviewing shots didn’t mean the script didn’t need his touch or that the art department didn’t need his input or the next day’s schedule didn’t need approval. Others were partners on all of these roles but they also required Jackson. In a day he might need to meet with the effects supervisor, set designers, concept designers, costume designers, the composer or see actual costumes for approval, or changes, to name just a few of the many things that require his time. He will confirm the schedule with his Assistant Director, producers and spend time with the Second Unit Director Andy Serkis, to make sure all is to his liking. 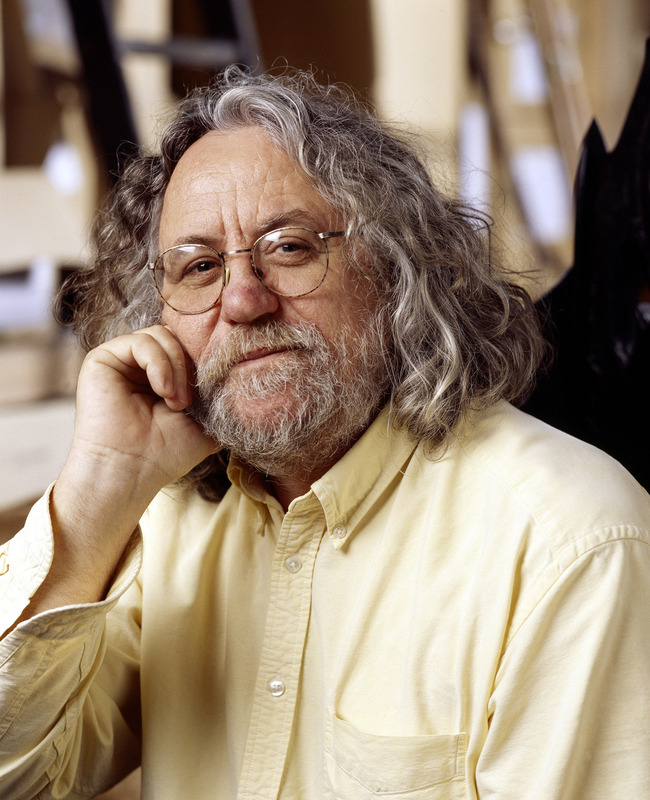 They need sets built, greens grown, existing sets decorated, concept guys working ahead, materials guys building everything, maximizing actors’ time, feeding all of those people, screening extras, bringing in the right number of prosthetic artists for the day’s schedule of actors and extras and on and on. In short, there is never a shortage of people who need Jackson’s input to work on his vision and it takes the logistics of — dare I say — planning a battle with five armies. In short, everything goes through Peter Jackson. Those are the reasons “The Hobbit: The Desolation of Smaug,” and his other Hobbit movies are genuinely Peter Jackson movies. It also means he is booked. And so it was, the last day of my time on The Hobbit set, after several assurances that my interview with Peter Jackson would happen — it did. I had been inside before, but not often. The day I shadowed him, I spent several hours, trying to melt into the background. This was his sanctuary and office. Posted in Alan Lee, Andy Serkis, Characters, Crew News, Director news, Director Rumors, Evangeline Lilly, Fans, Fran Walsh, Headlines, Hobbit Book, Hobbit Cast News, Hobbit Movie, J.R.R. 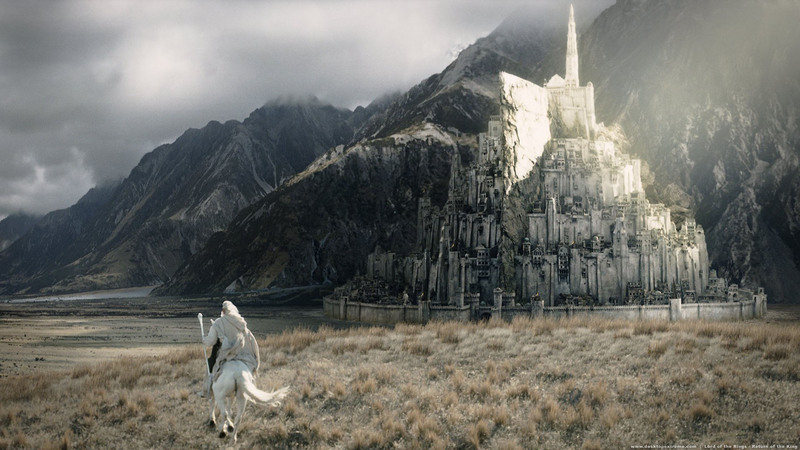 Tolkien, Locations Sets, LotR Movies, MrCere in New Zealand, New Zealand, Orlando Bloom, Other Tolkien books, Peter Jackson, Production, Silmarillion, Studios, Terry Notary, The Hobbit, The Hobbit: The Battle of the Five Armies, Tolkien, Tolkien Estate, Uncategorized, Warner Bros. The winners of last month’s Hobbit Fan Contest that got to go to New Zealand and watch an in-progress cut of “The Hobbit: The Battle of the Five Armies,” and experience the beautiful scenes of the north and south islands and the hospitality of Air New Zealand and Tourism New Zealand, won their spots by producing short films. As reports from the experience suggest, there was a great bonding of the 75 winners and their guests during the week-long tour of Middle-earth. These bonds are on display in a “thank you” video that the group organized to give to Peter Jackson and all the many folks who helped make the trip amazing. There is even a nod to TheOneRing.net which honestly touches us. 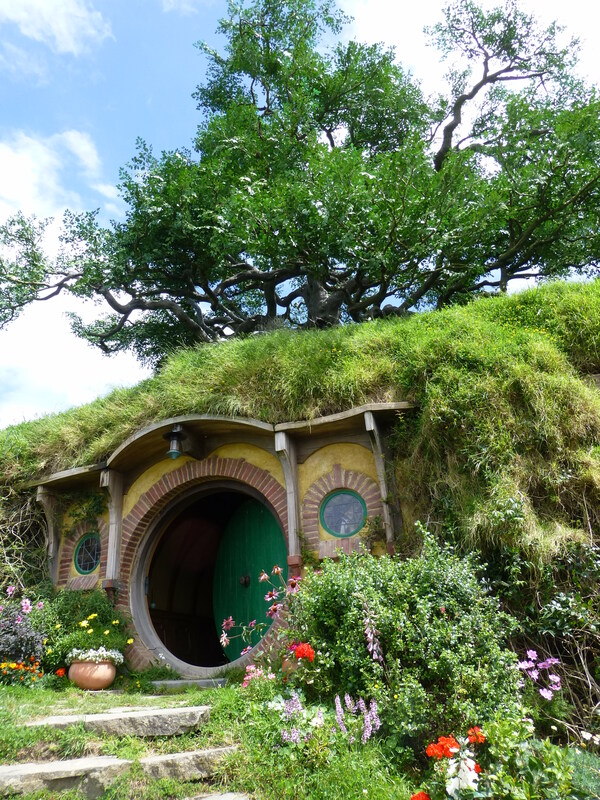 Brisbane tabloid The Sunday Mail sent writer Neala Johsnon across the pond to New Zealand in June 2013 for a stint on the set of The Hobbit during pick-ups. This article finally popped up in the paper’s mag last weekend. 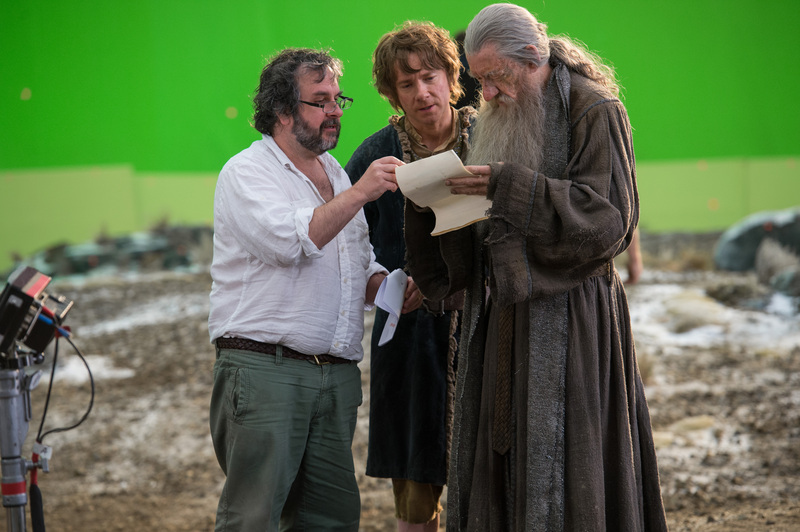 Our French friends Tolkiendrim today revealed a brand-new still of Gandalf and Bard conferring urgently within the ruins of Dale. This adorable video makes an excellent addition to Air New Zealand’s more lighthearted and fun approach to safety videos shown at the beginning of every flight. We’ve seen lots of photos of the Dale set in that was erected at Maupuia bush on the Miramar peninsula not too far from stone street Studios. But I don’t think we’ve ever seen one from above. Until now. 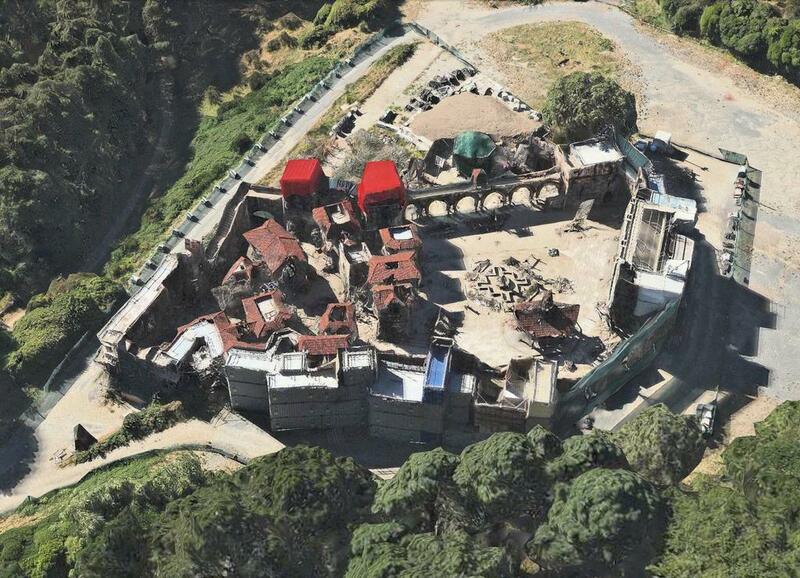 Ringer Duncan sends us the below image that he discovered on applemaps (which, weirdly, redirects to googlemaps but yano whatevs).